About 8.3 million people received federally administered payments in December 2012. The average monthly payment in December 2012 was $519. Total payments for the year were more than $52 billion, including more than $3 billion in federally administered state supplementation. The majority were female (54 percent). Sixteen percent were under age 18, 59 percent were aged 18 to 64, and 25 percent were aged 65 or older. Most (86 percent) were eligible on the basis of a disability. Six out of 10 recipients under age 65 were diagnosed with a mental disorder. More than half (57 percent) had no income other than their SSI payment. 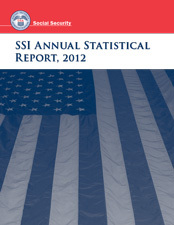 Thirty-three percent of SSI recipients also received Social Security benefits. Of the people receiving SSI benefits, about 2 percent were residing in a Title XIX institution where Medicaid was paying more than half of the cost. Despite their disabilities, about 314,000 recipients (4.4 percent) were working in December 2012.
suspensions, terminations, and duration of eligibility. Tables from the discontinued reports Children Receiving SSI and SSI Disabled Recipients Who Work were incorporated into this report beginning with the 2007 edition. Clark D. Pickett managed the preparation of this report. Judi Papas and Clark Pickett prepared the statistical tables and narratives. Staff of the Office of Information Resources edited the report and prepared the print and web versions for publication. All payments are federally administered payments. All years are calendar years unless otherwise specified. Numbers in the text and tables may not add to totals because of rounding. Monthly data shown in tables are for the end of the given month.